Black Eyed Pea is one of the most nutritious and potent beans with high content of calcium, and also iron and protein. This soup is a good comfort food for cold winter days. I made this soup for my hubby as he’s been down with cold and flu for past few days. He doesn’t get sick very often but this cold and flu really knocked him down. I wanted to make him feel better so I made all these dishes to help him bounce back to health. I’m big on home made remedial concoctions to heal and cure ailments as I grew up using these remedies. For this black eyed soup, I used lot of carom/thyme seeds (jwano) as these are believed to be good cure for cold and flu. My mother used to make this concoction of carom/thyme seeds with lots of ginger, salt and turmeric to relieve us whenever we had cold and flu. The black eyed soup is very delicious, yet nourishing too. If you are feeling under the weather or just need something to nourish yourself, please try this recipe. 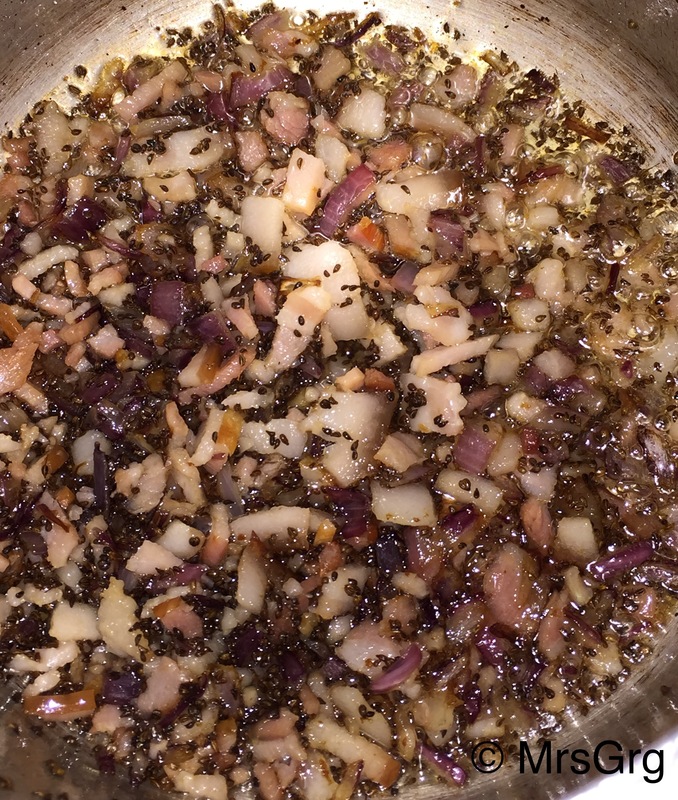 In a pot, heat oil and pop carom/thyme seeds. Add chopped onion and sauté for 2-3 minutes until it softens. Add bacon and sauté it until golden brown. 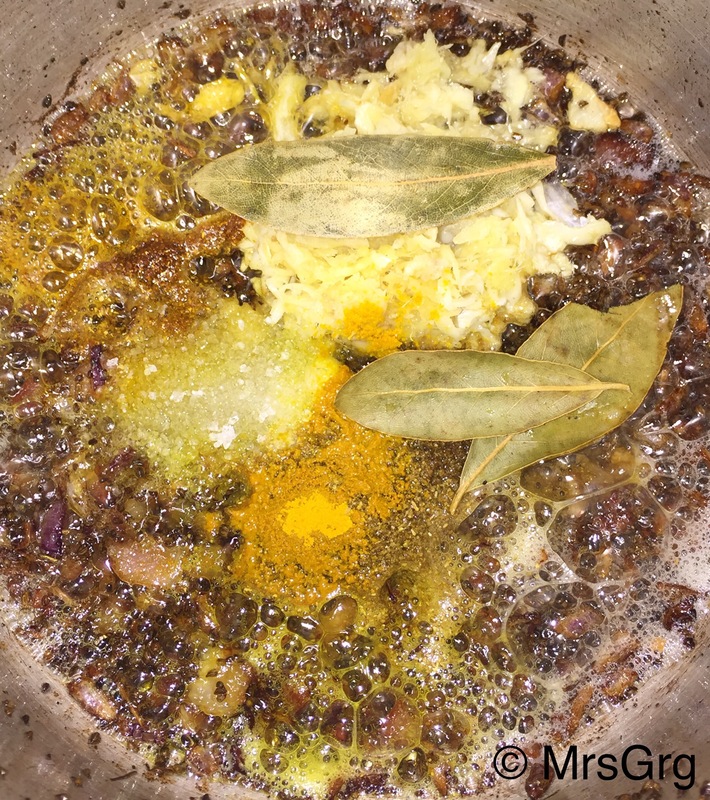 Add salt, cumin powder, turmeric powder, bay leaves and garlic ginger paste. Cook for spices for 1 minutes and add tomatoes. 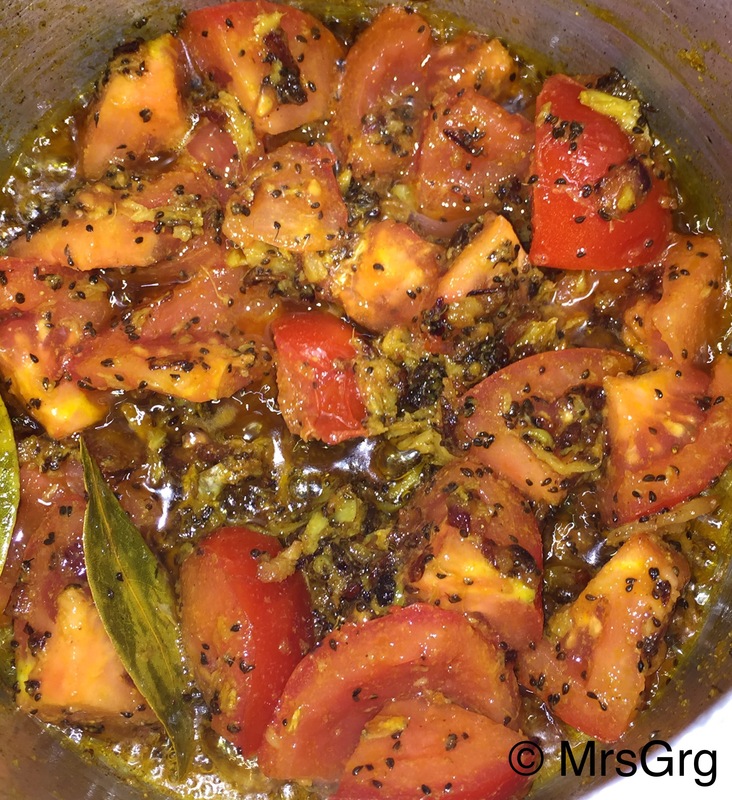 Mix well and cook tomatoes until soft. 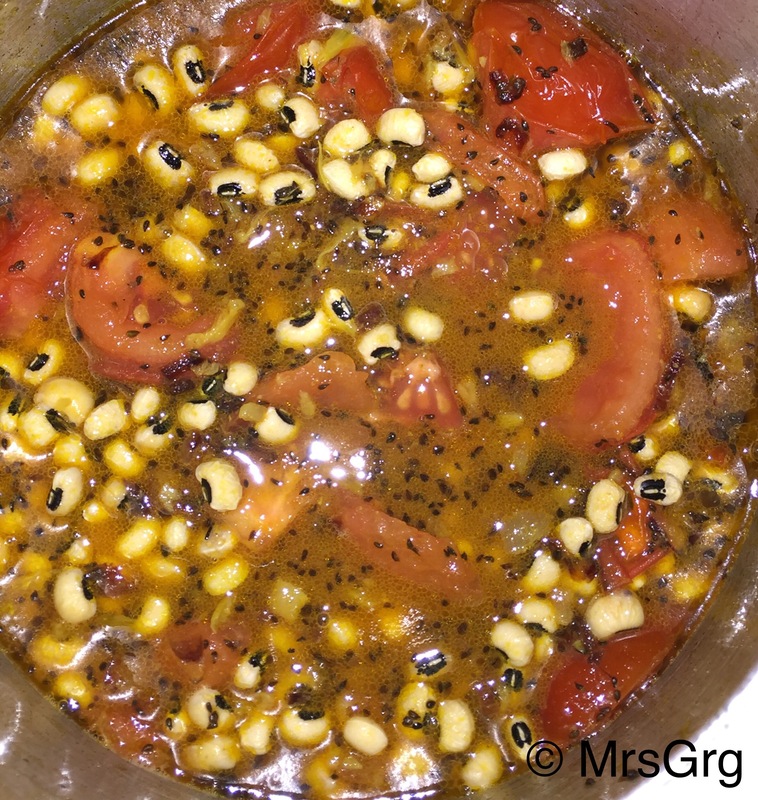 Add black eyed peas and liquid into the pot. Stir it and cover it with lid. 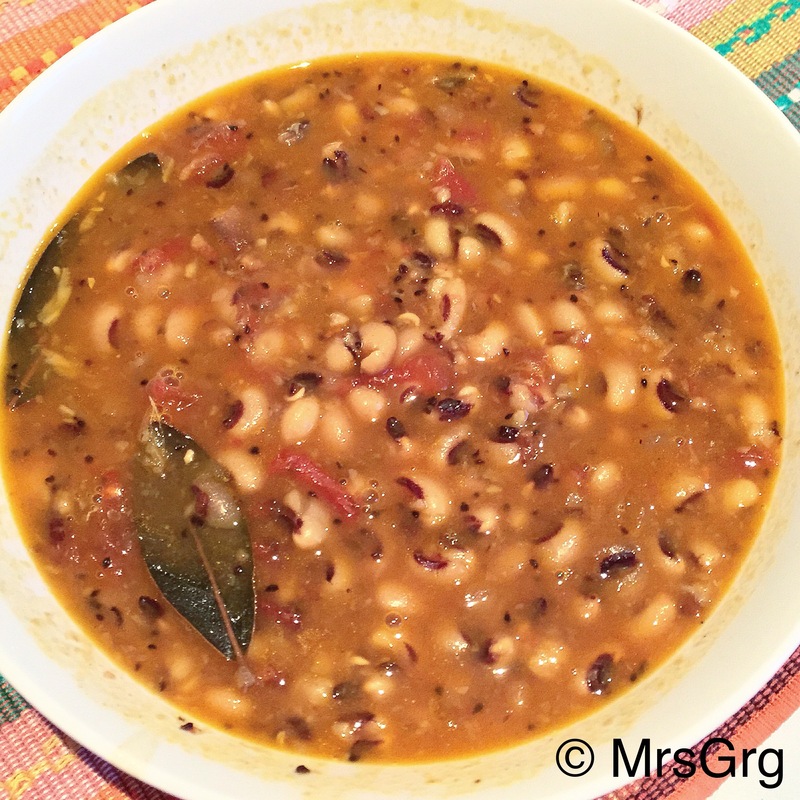 Cook for 15-20 minutes or until black eyed peas are soft and mushy but still holds its shape. Serve hot soup with a rustic bread or on its own with a dollop of sour cream or yogurt.